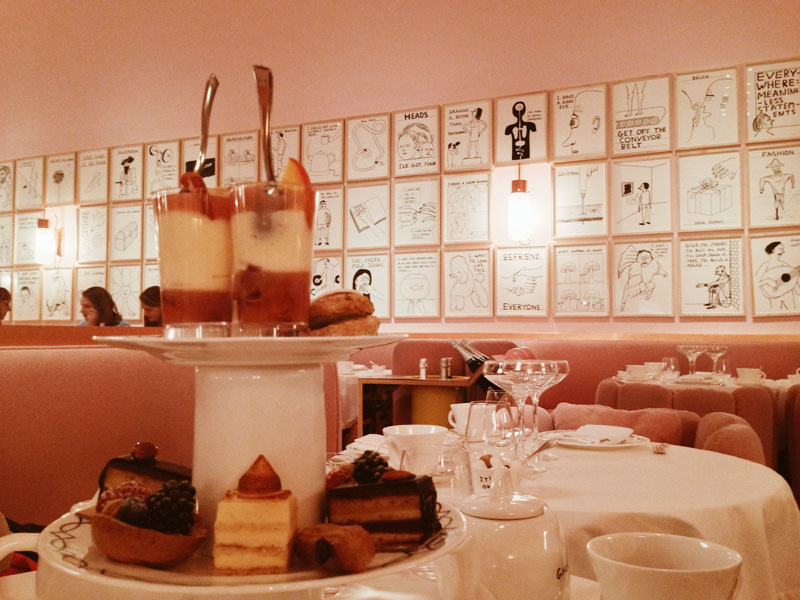 David Shrigley's pink paradise at Sketch is the perfect backdrop for an afternoon tea, that's sweet, sprightly and sophisticated in perfect measure. Having visited Sketch numerous times as a night time destination, and even previously for afternoon tea, I knew it had to be included in our list of afternoon teas to experience throughout the year. When French master chef Pierre Gagnaire and restaurateur Mourad Mazouz envisioned a destination to combine the very best of food, art and music, I doubt even they could've ever imagined how above and beyond that brief they could deliver. Sketch is one of my favourite day-to-night destinations in London. 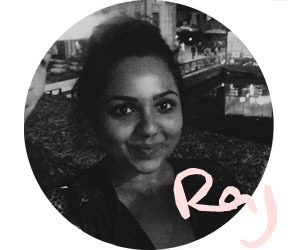 Before I had ever visited, a friend described Sketch to me as 'that place where every room is so different' and, whilst simplistic, that is still one of the most accurate descriptions I've heard to date. Each room at Sketch is like discovering a hidden wonderland that both takes your breath away and yet allows you to feel as comfortable as though you've become a part of it. 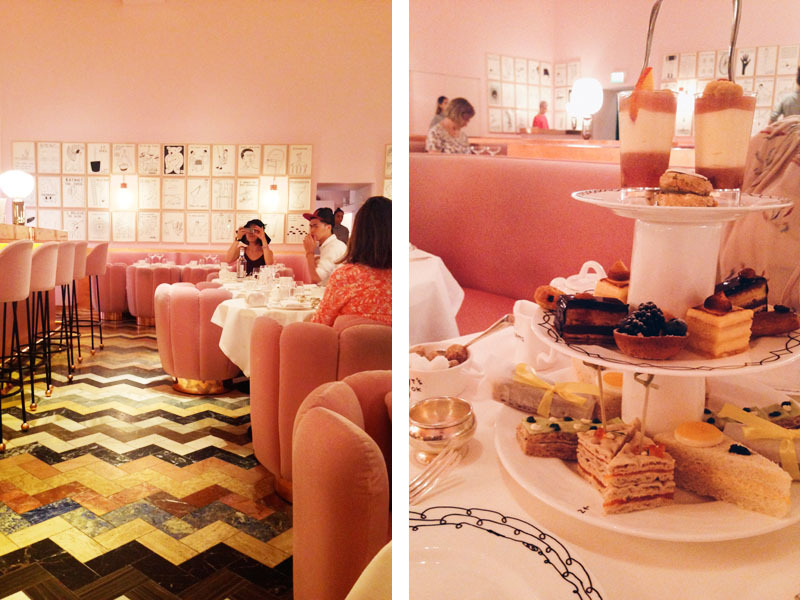 The afternoon tea we experienced in July was nothing short of sublime. Each item was an edible work of art. The sandwiches were (literally) like gifts, toasted and wrapped parcels of croc monsieur, fine layered cucumber sandwiches, or salmon or egg sandwiches topped with caviar, everything looked almost too good to eat... and yet tasted even better! Berry tartlets, coffee eclairs, bubblegum flavored meringue, each dessert was a contemporary take on a classic, as delicious and unexpected as the square scones! 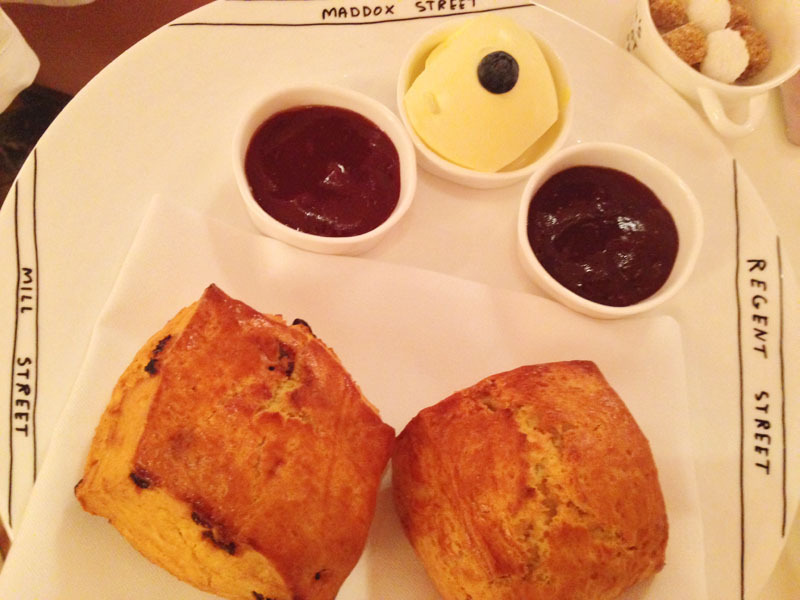 Sketch's afternoon tea is a feast that will satisfy your eyes and appetite alike, and that is just the food. Every two years sketch commission an artist to transform their gallery. 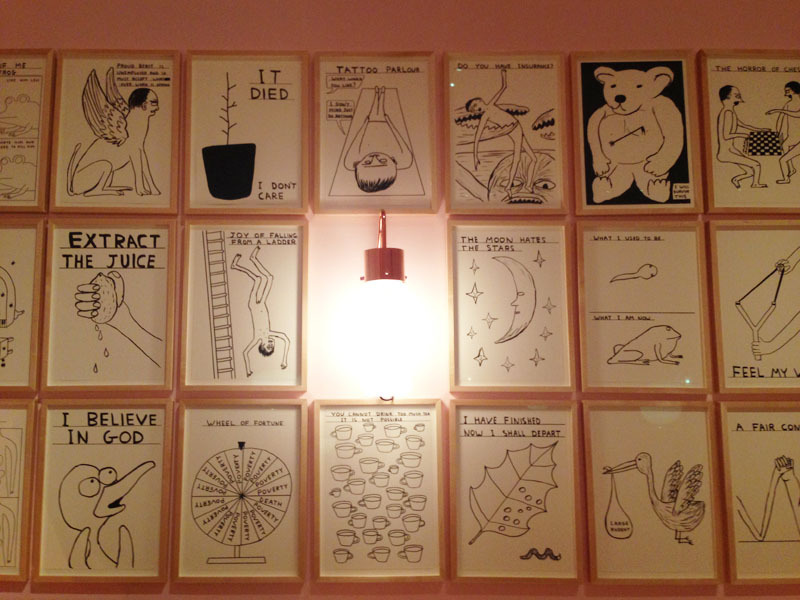 239 David Shrigley original drawings currently line the very pink walls, and more are laid out on your table. The witty and wonderful works in combination with Pierre Gagnaire's culinary masterpieces not only transform the composition of your plate but elevate the traditional afternoon tea to a living luscious piece of contemporary art ...and of course, a trip to Sketch would not be complete without a trip to their iconic dinosaur egg pod toilets! Whaaaat I did not know that the last picture was toilets lol. AH, but this place looks so cool! 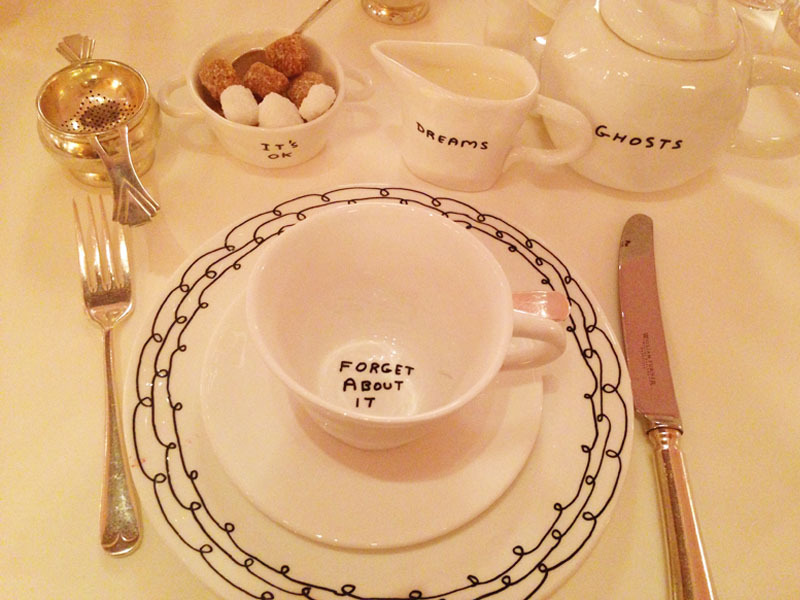 I love the how everything has labels sort of with the whole "forget about it" at the bottom of the cup, I think that's really cute and unique. Not to mention those parfaits (I think they're parfaits?) in that first picture look soo good. Glad you had so much fun there! This place looks so amazing, oh my gosh. I'm especially obsessed with all their plates! I want it all! Love this place! Looks amazing! This place is on my bucket list for sure! This place........ looks incredible! I would wanna try and visit it someday. I've never heard of this place but I wish there was one near me. I just love the ambiance and I absolutely love the decor and the food. Thanks for sharing this with us. Oh my goodness, this place looks insanely amazing! I have to say their plates and bowls and tiers are too cute! The setting seems amazing, and the concept behind the whole place sounds so smart!!! Dinosaur egg pod toilets!?!? Haha, so random but cool?!? Sounds a great place for hang out too. 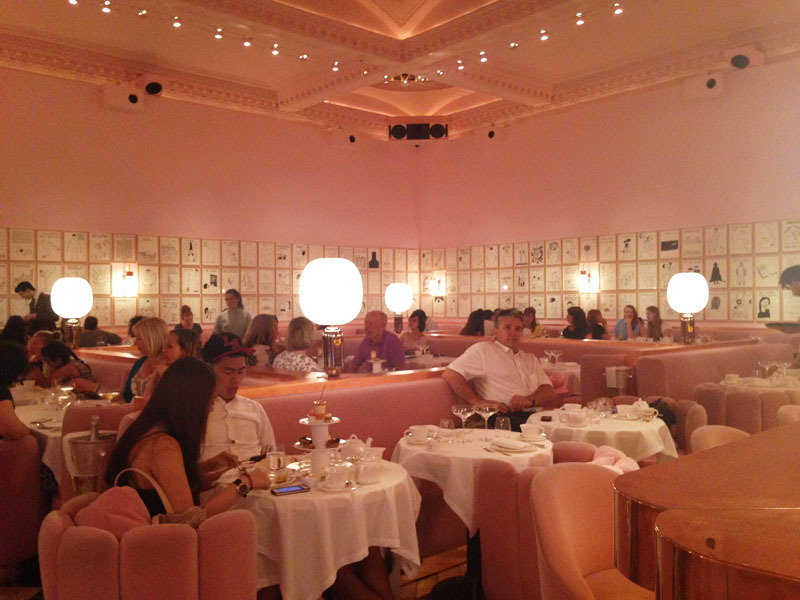 Sketch is one of the places I want to go when I visit London! 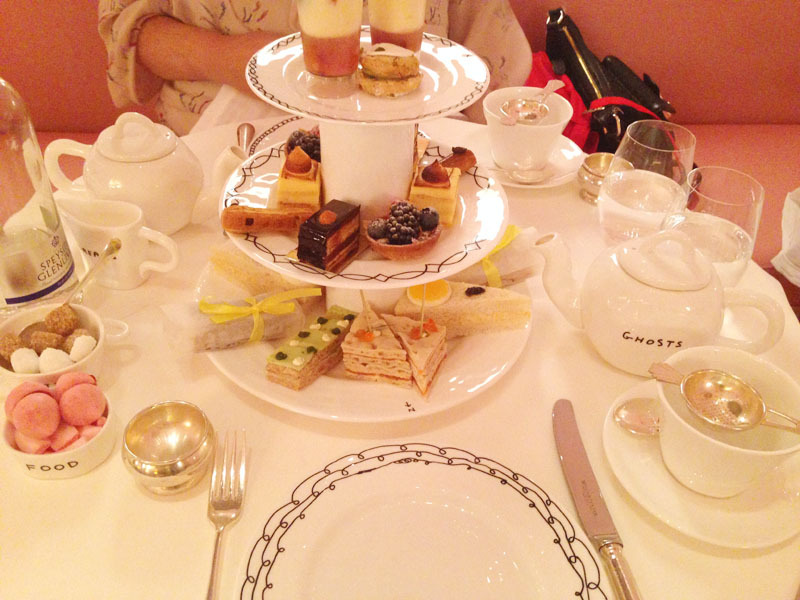 It is a beautiful place and afternoon tea looks delicious! Absolutely love this place, the colors and the designs are beyond cool! The food looks delicious! Sketch is so beautiful, I have only been once but definitely want to go again. I love all the pink ! I've seen photos of this place before. It looks so amazing!! i see photos of this place all the time, definitely want to go next time i'm in london! 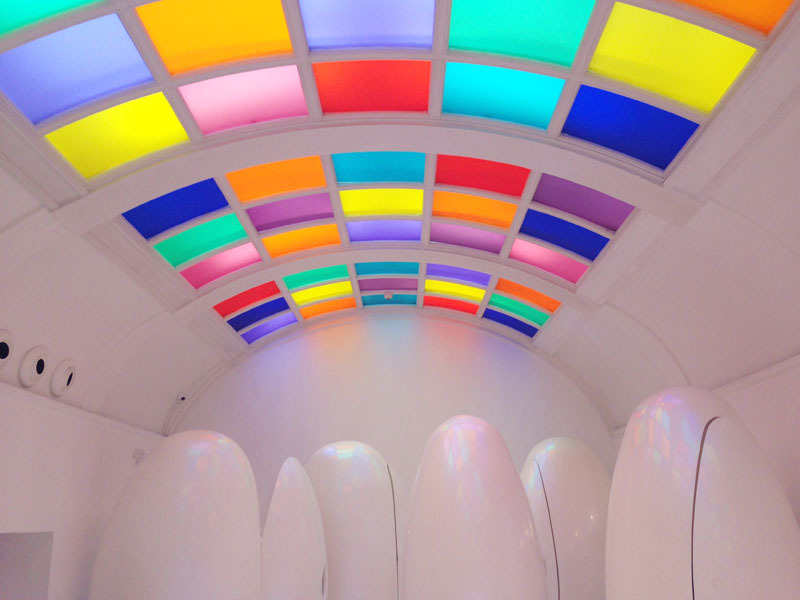 Sketch is one of my favourite places in London - how cool are the bathrooms?? Lovely post, dear. Nice to read it! Lovin this kind of tea party. WOW! The place is awesome and yummy cute food! Thanks for your wonderful comment on Qing's Style Please always keep in touch, I would love to hear from you! Aww this is such a lovely place! I wanna go one day! Looks like such a wonderful place to have tea! I love those seats - so cute! Is this London?? 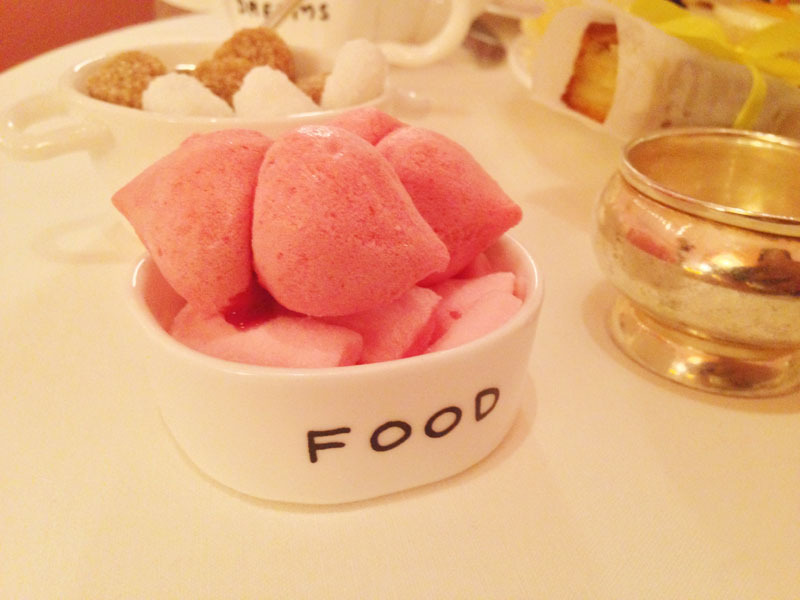 I'm going over the summer and the one thing I must do is have some good afternoon tea! Thanks for the recommend! you always take the cutest pictures! The cutest place ever!! I love it! I have always wanted to go here!